West Windsor, N.J. - Student Anabell Reyes admits that she did not know a lot about South Africa when she arrived there on July 16 with 10 students and three administrators from Mercer County Community College's Study Abroad program. But the lessons she learned during her two-week visit will last a lifetime. "I truly learned the meaning of the word 'forgiveness' and it will stick with me for the rest of my life," said Reyes, who observed that the South Africans she met have been focused on moving forward since the end of apartheid in the 1990s. Reyes shared her comments with her fellow travelers at a post-trip wrap-up session on August 15 at the West Windsor campus. "This is learning that goes way beyond the boundaries of the traditional classroom," said Associate Professor Andrea Lynch, MCCC's Study Abroad program coordinator. "We will be pulling significance from this trip for a long time to come." According to Lynch, the trip was heavily focused on academics and the daily schedule was demanding. She noted proudly, "We all stayed focused and stayed the course. It seemed like everyone had fun while we worked hard." Led by Tribal Meeting Tours, the group's guides proved a wealth of knowledge. "I want to thank our tour guides. They not only knew a lot, they had lived through it," said student Sierra Downs. Destination cities included Cape Town and Johannesburg and many cultural, historical, religious, academic and natural sites including the Apartheid Museum, Slave Lodge, Robben Island Prison, District Six Museum, University of Western Cape, Table Mountain, the Nelson Mandela House, an HIV orphanage, Pilanesburg Game Reserve, Cape Point and Penguin Beach. Students expressed awe at just about every aspect of the trip -- from their interactions with local people and the historically signficant sites they visited, to the beauty of the countryside and the thrill of seeing wild animals in their natural habitat. They also took some time to enjoy the music and food of South Africa and to purchase jewelry and other souvenirs from local merchants. Three students, Downs, Gerri Benjamin and Linda Robison, went on the trip as part of the curriculum in their African-American History course (HIS109), taught by Dr. Deborah Sanders. During the wrap-up session, they presented their research projects, drawing from course materials richly informed by their experience. All three students found striking similarities between the American Civil Rights Movement of the 1960s and South Africa's Anti-Apartheid Movement that took place over several decades in the latter part of the 20th Century. Robison, who focused her research on unsung heroes in both movements, was particularly moved by a sign she saw at the famous Regina Mundi Catholic Church in Soweto that read, "People who remember the struggle strive to do better." Robison noted that she has returned home with a changed perspective. "I want to do better. I want to make a difference," she said. Professor Sanders herself was moved by the student presentations. "You should applaud yourselves. You absorbed a great deal of information. You have touched my heart with all you experienced." Added Lynch, "I hope you have developed a love for travel and learning and an appreciation of cultural differences. We had an intensive, ambitious schedule and we got to do everything we set out to do." For more photos of the South Africa tour and photos from other trips, visit the Study Abroad Facebook page here. Study Tours planned for the coming academic year include: "Costa Rica - Science and Society," led by faculty members Dr. Gianna Durso-Finley (Sociology) and Laura Blinderman (Biology) from March 16-23; and "Warsaw - The Holocaust," led by faculty members Dr. Craig Coenen (History) and Dr. Jack Tabor (English) from May 24-June 2. 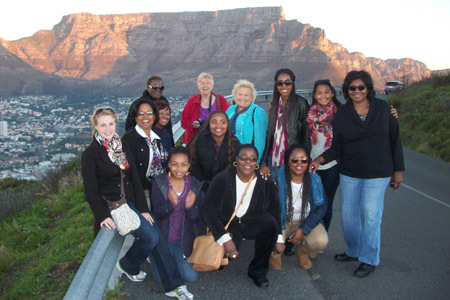 At Table Mountain, kneeling front, Langston Lynch, Gerri Benjamin and Erykah Jones; back from left, Sierra Downs, Study Abroad Coordinator Andrea Lynch, Linda Robison (back), Ruth Shuler, Bernadette Eichinger, Andrea Jackson, MCCC President Patricia Donohue, Suzieann Bennett, Anabell Reyes, and Director of Library Services Pam Price. 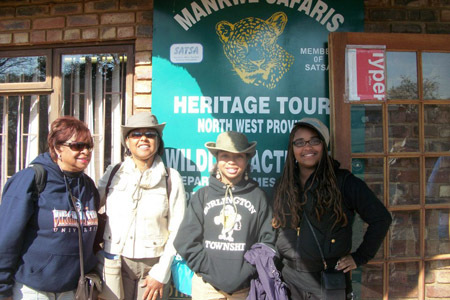 Intrepid travelers ready for their tour of the Pilanesburg Game Reserve. 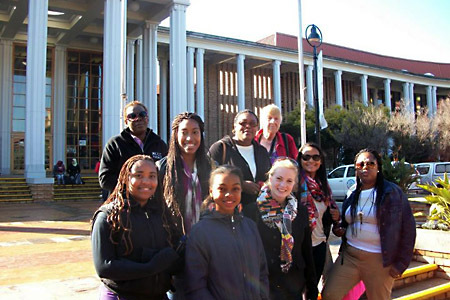 Group members are pictured outside the University of Western Cape, where they spoke with faculty and students about sociological and historical issues affecting their lives. 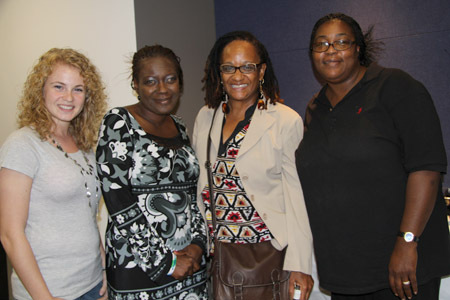 History students, from left, Sierra Downs, Linda Robison and Gerri Benjamin (far right), with Professor Deborah Sanders at the wrap-up session at MCCC on Aug. 15. 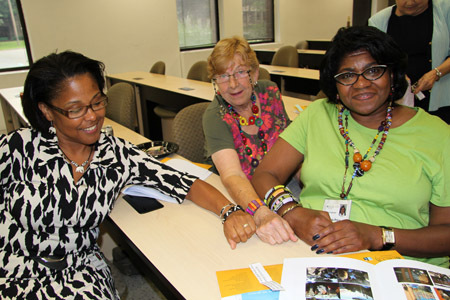 Displaying their souvenir jewelry at the wrap-up session are, from left, Andrea Lynch, noncredit student Bernadette Eichinger and Pam Price.